Edible flowers for a dining table centerpiece. The perfect burst of spring you need indoors. As soon as it feels like spring outside I want fresh peas and rhubarb. I want fiddleheads, asparagus and ramps. I want all of spring on my plate. In New England however, it takes a few more weeks for all those things to be growing locally and they won’t make it to my plate until then. What I can do is put some fresh herbs on everything as I patiently wait for those early local harvests. 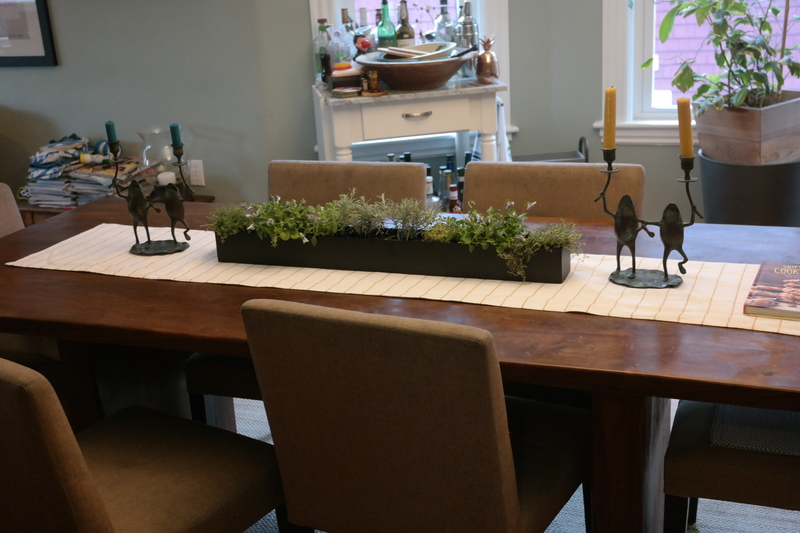 I worked with Wayfair.com and went to my local garden shop (Pemberton Farms) to pick up a few edible herbs and flowers for this spring tablescape that adds the feel of spring to the room and a taste of spring on the plate. At first, I thought about using a gorgeous glass trough as the planter, but then I realized that we probably wouldn’t want to be looking at dirt through the glass. I still liked the idea of glass because it is food safe and has a nice light to it. I thought about using some glass paint to colour the lower half, but then I came across a gorgeous metal planter that was the perfect size for my table. The most important thing to consider for a centerpiece is height. You don’t want the vase or plants to be so high that you can’t see over them. I always buy a few extra because I’d rather plant the extras in a separate pot for my kitchen than have bare spots in my centerpiece. I didn’t want any flowers or herbs that stood too tall and I wanted to make sure that all of the plants and flowers were edible. 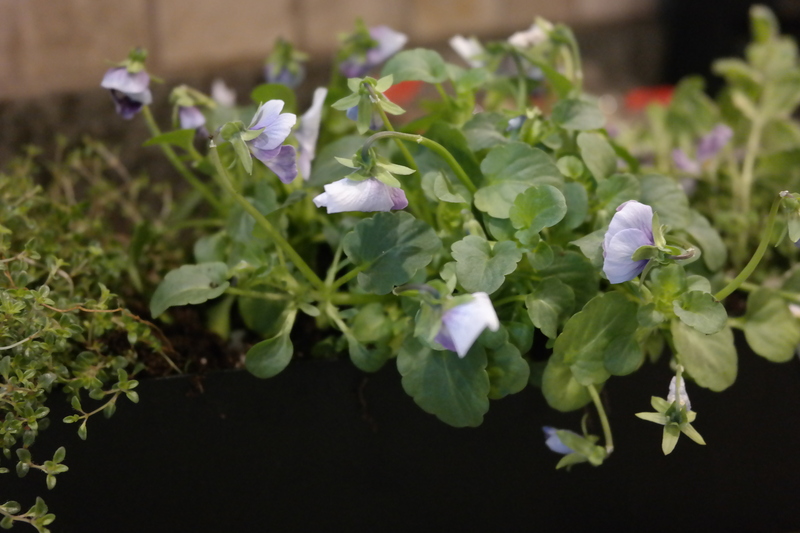 I chose two types of thyme, peppermint, curry plant (not to be confused with curry leaf), and violas . One of the thyme plants is a cascading plant so it will grow down over the sides of the edible centerpiece which I liked as well. Once you have chosen your vessel and the right number of plants to fit into it you will be just about ready to start. 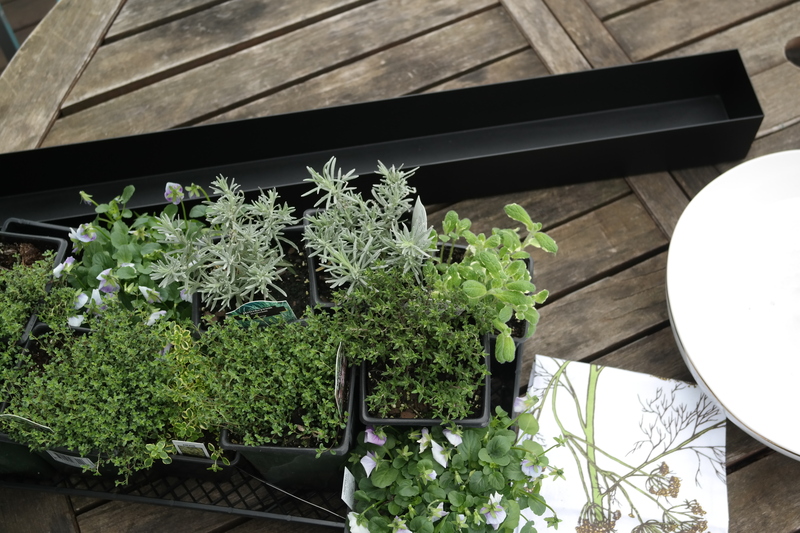 I often buy a bit more than I need and I will plant the extras in a separate pot. You just don’t want to have any bald patches in your centerpiece so more is always better. Cover your work space with some newspaper for easy clean up. Have a large bowl of dirt next to you. You will need some extra dirt to pat the plants into place, but you also need a bowl to shake off loose dirt as you repot the plants. I like to use a large ceramic serving bowl, and then if you have a scoop for the dirt, that’s great, but an empty plastic cup works well too. Lay your plants out in front of the planter to see what arrangement will look best. This gives you a chance to move them around before they get put into the planter. Put a thin layer of soil down into the planter. Carefully remove plants one at a time and place them into the planter. Remove the plants by holding them upside down over your bowl. Squeeze the root side of the pot while holding the plant at the base of the stems. The plant should then slide out. 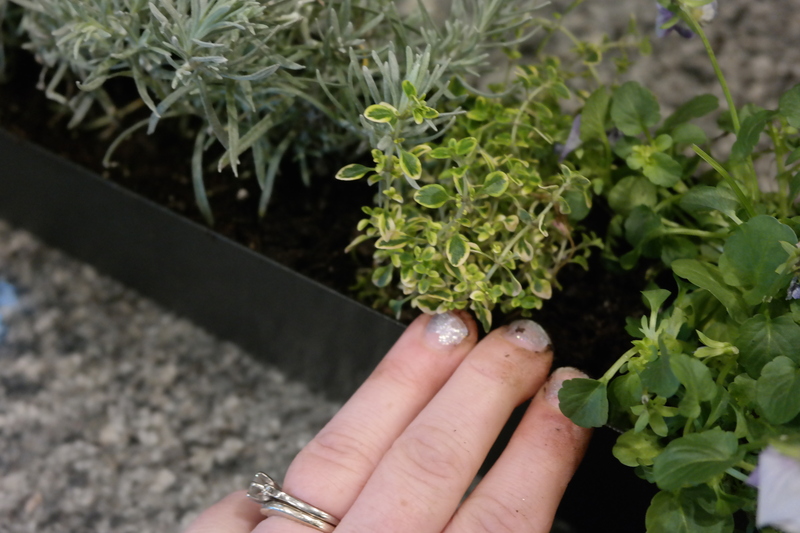 Once all the plants are in place, fill in dirt around each plant and gently pat it into place. 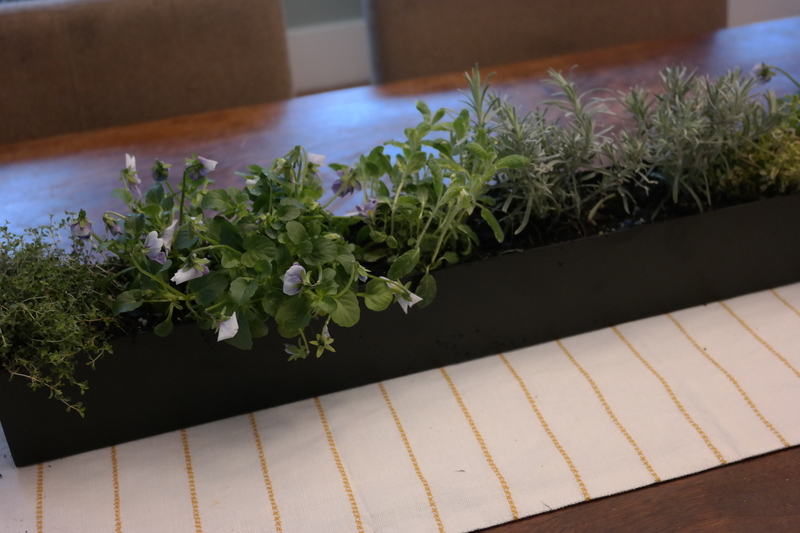 Once the edible centerpiece is done, brush off any excess dirt that may be on the planter itself. Put the planter in place and water the plants lightly until the soil is damp but not soaking wet. Water the edible centerpiece as needed to keep the soil damp. 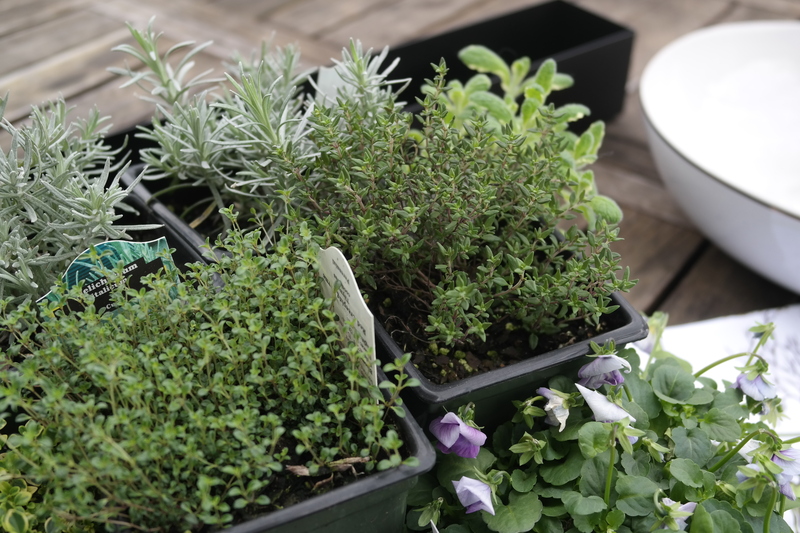 Snip some herbs as you make dinner and enjoy the greenery and scent while you dine. Choosing where it all goes before makes sure that you get the look you want. We love having the edible centerpiece down the middle of the table. During dinner, if we have many dishes on the table, I turn the planter sideways and we enjoy it from the end of the table instead. A burst of spring at the dinner table. Don’t forget the kitchen shears. A set of tools for planting and pruning. A set of towels for wiping up dirt and cleaning your hands. A few brushes: one for your nails (this is meant for a pan but has everything you need to restore your manicure), a gentle brush for the dirt that gets on the planter, and one to sweep up after. Kitchen herb scissors to easily cut the herbs that need for your recipe. Great way to bring a bit of spring indoors! I’m going to do this project today – thanks for the idea!